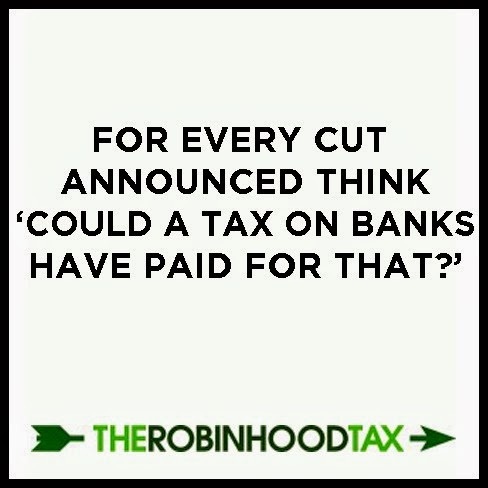 Ruscombe Green: Financial Transaction Tax passed! Tories walk out! Financial Transaction Tax passed! Tories walk out! In terms of the first motion.... it was the banks lack of regulation that was a significant part of the cause of the economic crisis......other than a few regulatory charges and fines, they haven't felt the effects. The UK's five biggest banks' core profits actually rose by 45% to £31.5bn in 2012. Bank bonuses are in the press this week even where profits have fallen....and poverty and inequality are on the rise. This tax could generate an additional £20bn, providing much-needed revenue that could reverse many of the most damaging cuts. In just over five days it could pay for 10,000 newly qualified teachers to be employed for a year. Or in one year, the tax could fund Europe's share of the Global Green Fund to tackle climate change. Another advantage of an FTT is that it helps reduce the number of risky financial transactions - the gambling which helped to trigger the financial crisis. £25bn is already raised in 40 countries from such taxes annually. Financial Transaction Taxes exist in major financial centres such as Hong Kong while Brazil, for example, channels a proportion of its FTT revenue into local government spending. Even Britain has one of sorts – the stamp duty on shares that raises the exchequer £3.5bn a year. Around 40 councils have already passed such a motion with Plymouth being the first in the South West. Eleven Member States including Germany, France, Italy and Spain are signed up. It is time our Government stops blocking this tax and signs up. As I said at Full Council: "Taxing the financial sector is a matter of fairness. The financial institutions got and continue to get huge support from the public sector to overcome the crisis. I will be supporting this motion." It was passed but as noted without Lib Dem support. Apols I would write more but must to bed....no doubt the press will now make more of a story about this since Tories walked out - a good thing as this is a key issue that needs serious discussion. See motion details on SDC website here.